once again being used here in S. Illinois. Bob, Shannon and Flip went to the ATV Banquet and had a great time. And upon returning back to Mt Vernon we discovered that the band was up on 1.2 GHz between here and St Louis. Bob and Flip worked John KD0LO with P5 pictures both ways. Of course by the time Flip got home there was no joy in West Frankfort. The band has been kind to us, DX contacts abound for the past two nights, contacts all over the midwest, stay tuned. about a half hour with sync bars building to P-2+ video.!!! P-5 into KA9UVY and K9KKL, N9XHU both P-3 into KA9UVY and P-5 into KA9EGM. hitting the air for the first in a long while. KD0LO now in Wildwood MO. had good ATV conversation with him. much in the way of video. The first morning of the contest provided KA9UVY with a P-1 contact with N9XHU 113 miles and KB9JGF 243 miles. KB9JGF reported hearing KA8MID and KB8GUE both working stations for the contest. The only Ohio station heard here in S. Illinois was W8RVH but no video made it through. If you are within 300 miles of Indianapolis IN look for a group of ATV'ers and Slow Scan enthusiast on every morning after 6:00 am CDT. The ATV Contest started today and the band was pretty flat. KA9UVY made only 4 contacts 2 of which were on 23cm with N9AZZ and W9AZZ @26 miles. Video was attempted but only sync from K9KKL @ 112 miles. UVY has 2 skeds for in the morning and will be calling CQ for a few hours at daylight. Other stations in St. Louis Mo. were heard but no video yet! Victor (N9PRP) from Richview IL returned to the air Saturday 04/12/03 after at least a six month period of inactivity. His signal was a P-5 into Mt. Vernon at KA9UVY a P-4 into W. Frankfort and he also made his first contact with Matt, N9TWH in Johnston City. Unfortunately his rotor failed by the time we got some guys at St. Louis on and he did not get to make the trip across the river. Bob KA9UVY took the rotor down for repair today 04/13/03 and it seemed to have suffered the same failure as before. Vic should be on again soon and for now his antennas are locked on the Mt. Vernon heading. The first big signals of the year were received here this morning in Southern Illinois. Stations in Springfield K9KKL, N9XHU were seen at P-4 and P-3. They both enjoyed P-4 to near P-5 pics from KA9UVY along with K9SM in Litchfield IL. who reported near P-5 reception for a short time. KA9EGM in Centralia came along late but even his signal was enhanced to P-4 into Mt. Vernon. 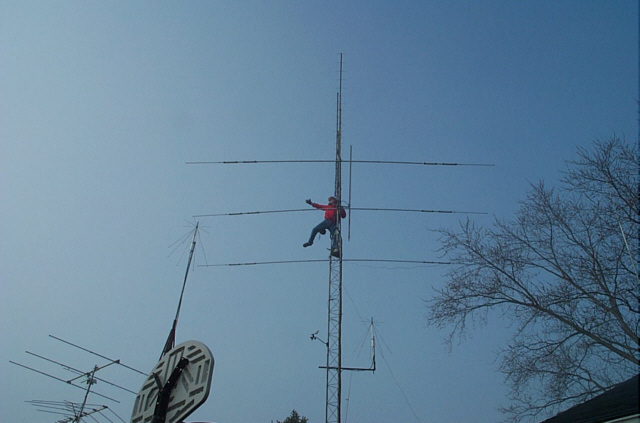 A station in Eldorado IL checked in on .340 with much interest and was lobbied as a future ATV operator. The UHF conditions were super into the South East and many UHF HDTV stations were seen here for the first time unfortunately no one down that way answered any CQ's. Well Dave N9SHA is seeing both Flip and Bob on 1.2, and he is absolutely smokin' into Mt Vernon on 70 cm. We got Dave back on the air a couple of months ago, but a faulty connecter on the tower put him on the sidelines after just a couple of hours. He's back now with a vengeance. Roving antenna party day! 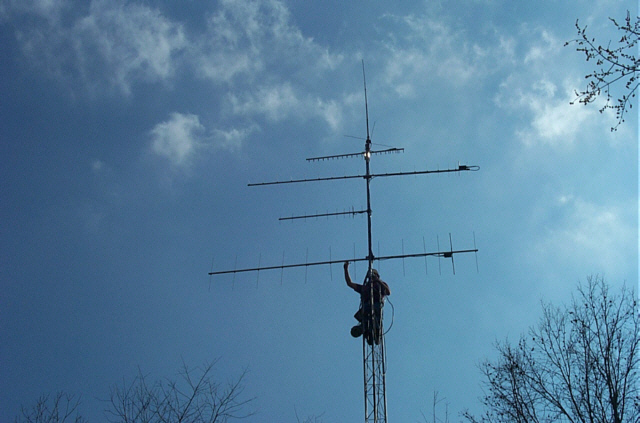 Bob KA9UVY and Shannon KC9BIE first drove down to Flip's and replaced his 25 element 1.2 yagi with a new 45 element version. Then Flip, Bob and Shannon drove to Dave's house (N9SHA), where Dave's complete array was rebuilt. Flip's old 1.2 antenna was put up, and his 70 cm antenna repaired, as well as other new stuff put up. Dave, who is "THE MAN" when it comes to home brewing mounts and the like, made a stand off for his new 1.2 yagi, just out of something he found laying in his shed. Bob, KA9UVY has suggested to the ATV community that a ATV DX contest be held. Ideas are bouncing around the ATV mail reflector like ping pong balls. Watch here for updates. Today at Bob's suggestion, Flip installed a guestbook on the main page. About time isn't it, after being online since early 1999. Flip and Bob also received their Tohtsu relays for 1.2 and UHF. Also the special sequencer switches arrived for controlling the gear. Bob, KA9UVY has received a Mirage D1010N. His new transmitter with its modulator power being low, he is able to get a little more power out than he could with his teletec, which in turn drives the big amp. The Echolink node is working well. We have made contact with other ATVers in Minnesota, New York, and Canada. Come on guys, give us a call. PROOF !! Tonight during a video round table Flip finally has proof that Matt N9TWH holds his 2 meter mic 8 inches from his mouth. 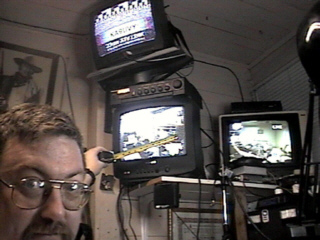 Matt N9TWH is now QRO, with 60 watts of average video !!. He bought Bob's extra tube amplifier, which is a single 4cx250B. He went from a sync bar, to a stable P1.5 in Mt Vernon, at Bob's QTH. Bob and Flip packaged Flip's 1.2 transmitter tonight. It's now housed in a die cast Hammond case, painted black, and looking sharp. 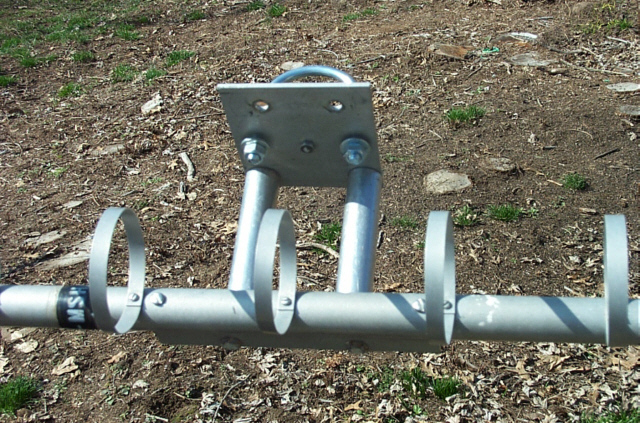 Next on the list is assembling the new 45 element loop yagi. The first 2-way 1.2 GHZ FM TV contact between our intrepid microwave ATVers was made tonight. At 0856z (2:56 AM local) Bob received Flip at a P4 level, and Flip had Bob burning in at a P5. It was the first time that Flip had fired up his new 18 watt amplifier. All contacts prior to this over the past couple of years had been one way only. The UPS and FED-X man visited Flip today, Downeast 1.2 low noise preamp, 18 watt brick, a new enclosure for his 1.2 module, and a 45 element loop yagi. WOW! Bob KA9UVY seen a couple of the St Louis gang on video tonight. Dave is back on the air!! N9SHA has a tower up, and is back on TV BIG time. Today Bob, Flip and Shannon traveled out across the vast tundra to Dave's house and raised his tower. Reports this evening are showing that Dave's TV signal is better in Mt Vernon than it ever has been. 1.2 GHZ excitement is again building. Bob KA9UVY is regularly being seen at N9AZZ. Flip today ordered a preamp for the band, a 18 watt power amp, along with a 45 element loop yagi to replace his 25 element. Flip plans to send his old antenna to Dave N9SHA who still has a receiver. The first Microwave video relay was accomplished tonight. Flip relayed Bob's 1.2 GHZ Fm video to Matt on UHF in real time. Flip N9AZZ and Bob KA9UVY had fun with the first full duplex ATV contact tonight. Flip transmitted on UHF AM TV and Bob on 1.2 GHZ FM video. signals were P5 both ways. Matt N9TWH has moved to Johnston City, where is has been able to put up an antenna for ATV. He puts in P5 Video in at N9AZZ and P1 to P2 video into KA9UVY. Flip N9AZZ, Bob KA9UVY, and Shannon KC9BIE toured WSIL-TV3 (DT-34) tonight. Steve KC9AOY who is an engineer at the station gave a most interesting tour of the facilities. 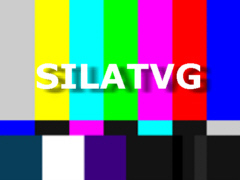 Steve has an interest in ATV, so we hope to see him on the air soon. Flip shot a lot of video, which has been shown on ATV to the group. Dave N9SHA has moved to near Thompsonville IL. His tower is not up, but a two tower project is on the drawing board. However Dave has his ATV yagi mounted on a Tree Stump in the front yard, and he has P4 to P5 video into N9AZZ. He has also been seen at KA9UVY, and N9TWH.